Here I will give some brief answers to some frequently asked questions FAQs. I can already play a bit – what else can you teach me to improve? 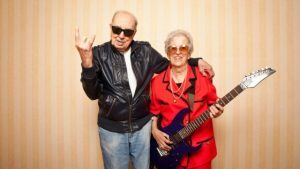 Am I too young / too old to learn guitar? Do I need to read music or learn theory? 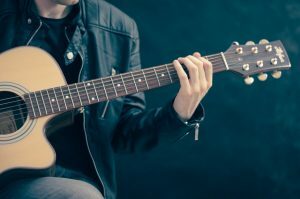 Does it matter what type of guitar I have – acoustic or electric? Holding a plectrum and picking single strings. For beginners, it is vitally important to develop good habits and the correct techniques from the start. Many books and online courses skip the fundamentals which can then slow your long-term progress. I will help you with essential skills of tuning, holding a plectrum, good body position and finger placement. The aim is to start to make music as soon as possible which means learning to pick out single notes and to play simple melodies. As you progress you will learn to play and change between a few chords. With just three chords, some basic strumming patterns and a little bit of rhythm you will have literally hundreds of songs you could play. And that is where the fun really begins. 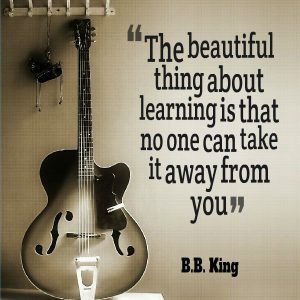 My guitar mantra is ‘learn songs, learn songs, learn songs’. Once you have a few chords under your belt, once you can play a few songs, you’ll be on your way. You’ll have taken the first steps to be entertaining your friends at parties, performing at open-mic nights and playing along to your favourite music. Maybe you can play the cowboy chords and can strum along with all the busking songs. 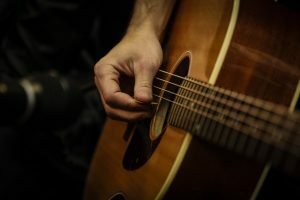 You may be returning to guitar after a long break and want to dust off the cobwebs and take it further. For guitarists looking to extend their skills, the start point is to assess what you can do and what you would like to be able to do. 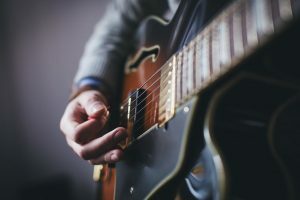 I will firstly help you consolidate your skills by making sure you have solid technique, good rhythm, and can play a selection of songs. 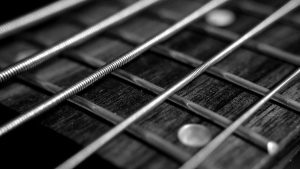 We will look at barre chords, triads, power chords and double-stops. This would be a great time to learn some theory so you begin to understand what you’re doing and how it works. You may want to start to learn scales and begin to play lead guitar. Additionally, I can work with you at extending your playing by teaching different styles according to your own taste. I can introduce you to playing rock & pop, acoustic singer-songwriter, folk finger-style, rhythm & blues etc. I can also give advice on how to adapt your style when playing in a band or group. 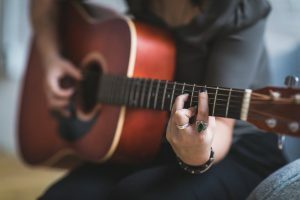 Guitar lessons – how often? The frequency of lessons is up to you although I would advise you take regular lessons every one to two weeks. Regular sessions will help you focus, maintain enthusiasm and continue to develop correct technique. In addition, between lessons, you will benefit from a little and often practice habit. Fifteen minutes per day is better than one hour once a week. The total number of lessons you take is entirely up to you. Realistically, if a beginner, you need to be thinking in terms of months before you achieve a basic proficiency. If you are relearning and topping up your skills then you may want to take a block of lessons and then dip in and out. Too Young / Too Old? I cater for all ages and welcome children and adults alike. 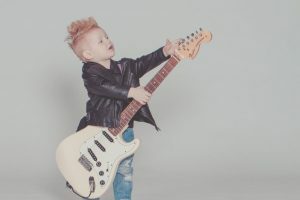 In general, children from the age of about six up should be able to learn to play guitar. And there really is no upper age limit. That said, certain allowances may need to be made for students of different ages. Different aged students might require different approaches because of hand-size, suppleness, dexterity, finger strength etc. But age should not present a barrier. I have taught students ranging in age, the youngest being eight and the oldest being over sixty. Whatever your age and whatever your ambitions with guitar I can help you to start or take the next step. And the emphasis will be on playing and having fun! Read more about lessons for young students and mature students. I will use and teach some simple guitar tablature (TAB) and chord sheets for songs. Additionally, learning a little music theory can be useful – though not essential if you just want to play for fun. Therefore I will teach some aspects alongside your practical learning to help you understand what you are doing. If you want to explore theory further I am happy to teach chord construction, scales, the circle of fifths etc. What type of guitar should I learn on? There is no right or wrong answer here and it does depend on the type of music you want to play. I enjoy both acoustic and electric for different music and moods. Electric guitars may be easier at first due to having thinner strings and smaller necks. Acoustic guitars can be played anywhere with no amp or power required. I can advise on and help source the purchase of suitable guitars and other essential equipment. Additionally, if you already have a guitar, I can perform basic set-up and maintenance work to make it easier to play. Too young to Rock ‘n’ Roll? Young students face several issues that necessitate a different learning path to adults. Their small size and small hands will require them to focus on single-string melody and songs. I aim to select contemporary and fun songs that they will enjoy playing. This is also a good time to introduce reading basic guitar TAB (not music notation). TAB maps out the notes on paper that they follow with their fingers on the guitar. At these early stages, having fun and learning good technique is vital for continued enthusiasm and success. Once they become proficient and develop finger-strength, learning will move to chords, rhythm and songs. NOTE: I have an Enhanced DBS Certificate (formerly CRB) and undertake regular Safeguarding Training relevant to working with and teaching children. 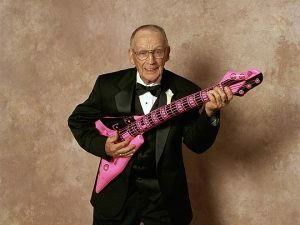 Too Old to Rock ‘n’ Roll? Mature students may require a similar approach due to the reduced flexibility and fine-motor control that does come with age. Carefully designed practice exercises will overcome these obstacles. The aim is to learn new skills and train the body to work in new ways. You literally are never too old to learn. You may just need a little more time and patience. I am a teacher by training and profession. I have over 25 years experience teaching in schools and colleges in Teesside, West Yorkshire and South London. I have over 10 years experience teaching in Primary schools and over 15 years experience teaching in Secondary schools. I have also taught in Adult and in Further Education. I have a consistently good record of helping students to achieve and have been awarded certification for upholding the post-threshold standards for effective teachers. I hold degree, teaching and diploma certificates relevant to teaching. I have Enhanced DBS (formerly CRB) Status. I have undertaken regular training for Safeguarding chldren. I also hold a basic first aid certificate.